You wouldn’t want to go into a criminal trial with just enough proof for your client to be acquitted would you? You’d want to have overwhelming, insurmountable and incontrovertible proof that your client was innocent. You’d also want hundreds of witnesses confirming your client had an alibi. If proof is what convinces people to make the right decision then shouldn’t you be gathering proof about your business? Proof that you are good at your job. That you do what you promise. That your price is fair. Whatever someone else says about your business is 1000 times more powerful than what you say. 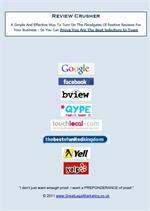 Online reviews area a must for your business. Grab this training, implement it and grow your reviews. You'll find more clients coming your way already pre-sold on your law firm.